Are you struggling to measure your Pinterest efforts? Do you want an easier way to track pins and engagement? The new Pinterest Analytics tool gives you access to a variety of data, including how potential customers interact with your pins beyond your website. In this article I’ll share how the new Pinterest Analytics features help you get the most out of your Pinterest marketing. Pinterest’s original analytics tool only shared information about how users interact with the Pin It button installed on your website. Unfortunately, those stats couldn’t give you a complete picture of whether your overall Pinterest efforts were working. The newest Analytics features give you access to quite a bit more data, such as stats on engagement beyond your Pin It button. Now you can track actions that originate from your Pinterest profile—including boards and the pins you share (whether the pins are from your own website or not). 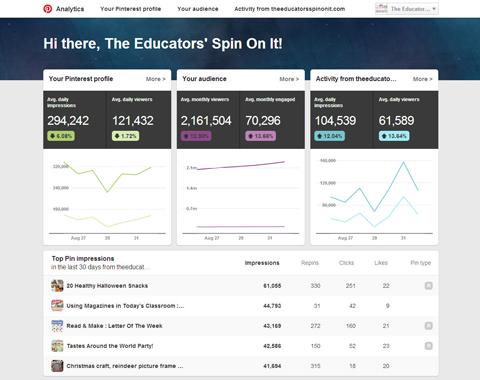 Check out new features found in the new Pinterest Analytics. Why is this important? Many successful pinners spend more time curating and sharing content from websites other than their own. The updated Pinterest Analytics tool gives you the data you need to see the bigger picture and determine where to spend your time and effort to maximize your presence on Pinterest. 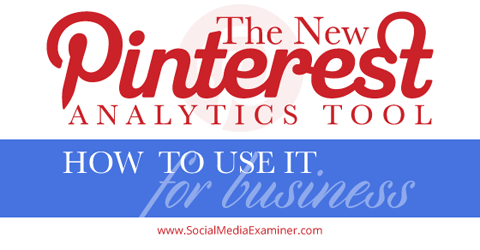 To gain access to Pinterest’s new analytics, you must have a Pinterest business account. When that’s in place, head over to your analytics dashboard. Your Pinterest Analytics dashboard shows an overview of the three main categories: Your Pinterest Profile, Your Audience and Activity From (Your Website). You can click on each category to see additional details and have a better idea of how your Pinterest efforts are paying off. New features include three categories overflowing with data. The bottom of the page features your five Top Pin Impressions from the past 30 days. At a glance you can see how many repins, clicks and likes these pins have and whether they are rich pins. Below I’ll go through the main analytics categories and show you what you can find in each. 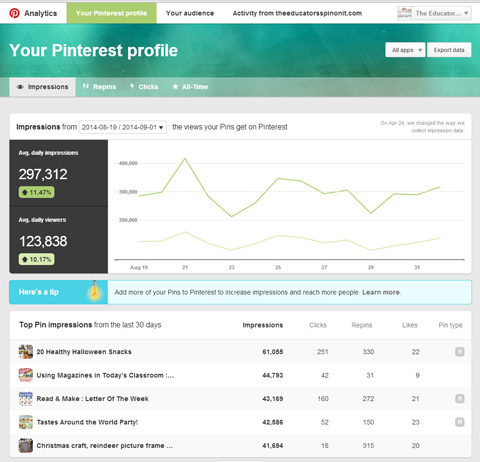 The Your Pinterest Profile category has four sections: Impressions, Repins, Clicks and All-Time. The Impressions section shows your top 50 pin impressions and your top 20 boards with top pin impressions. If you click over to Repins, you can see your 50 most repinned items and which of your boards have the most repins. The Clicks section is pretty much what you’d expect: A detail of your 50 most-clicked pins and your 20 boards with the most-clicked pins. 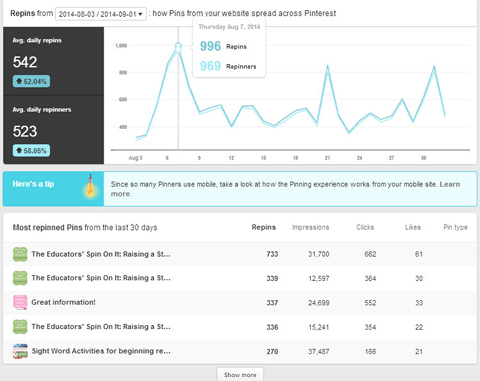 You can also see the number of repins, impressions, clicks, likes and # of pins. Impressions metrics are easy to find. The All-Time section is particularly helpful. Here you’ll see your 50 most repinned pins, your pins with the highest search rank and power pins (pins with a high mix of clicks, repins and more). As you review this data, note which topics people are searching for and provide more of that content. Don’t forget to repin your top pins to different boards or group boards. It’s a good way to get that content in front of new pinners who may not have seen it the first time around. Keep that momentum going! It’s not often that we get a free glimpse into how consumers self-select their interests, but that’s exactly what the new Pinterest Analytics tool is giving us in the Your Audience category. For the first time, Pinterest is sharing details about the users interacting with your pins. The Your Audience category offers an important filter option. 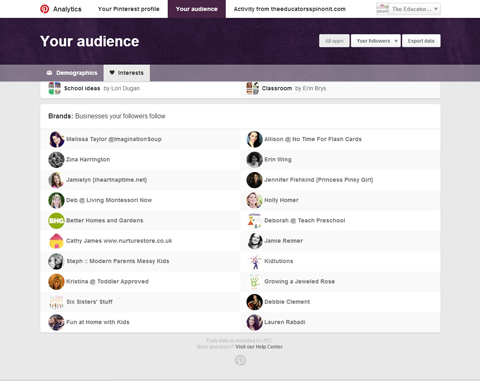 In the top right of the page you can choose to filter data by All Audiences or Your Followers. All Audiences highlights the entire audience of Pinterest, while Your Followers focuses on just your followers. Viewing and comparing data from both are vital to understanding how your Pinterest performance measures up to your goals (and your audience’s needs). Compare data from All Audiences and Your Followers to see the big picture. 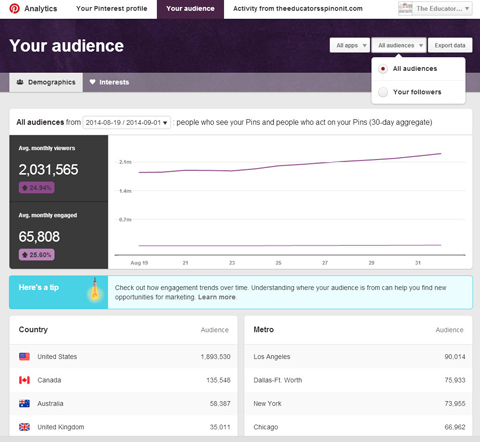 You can use the All Audiences and Your Followers filters on both the Demographics and Interests tabs. The Demographics tab is easy enough—it shows you basic audience data, including location, language and gender. You may find the Interests tab a bit, well, more interesting. If you want to find out what people are talking about or looking for, this is the place to be. Definitely look at how your All Audiences data overlaps or differs from the Your Followers data. By comparing them, you can home in on the topics your audience is searching for and create content to match. As you compare the data, ask yourself these questions: Does your content match the interests of your typical pinners? Is your content reaching the intended target audience? Keep an eye on how your competition is using Pinterest. Another important new feature lets you see the other brands your followers are following. Knowing which business accounts are similar to yours is extremely important on Pinterest—it’s always good to keep an eye on the competition. Encouraging people to pin articles and images from your website is a key element of Pinterest success. The Activity From (Your Website) category shows your website’s 50 top pins and 20 top boards and how their impressions, repins and clicks stack up. You also have access to three other important stats: Original Pins, All-Time and Pin It button. Original Pins shows you the 50 newest pins shared from your website. This is valuable because you can easily tell which topics are resonating with your audience (and create similar content for even more pins). See how effective pins from your website are. As with the Your Pinterest Profile category, the All-Time option gives you the top 50 pins that are most repinned, rank well in search and are power pins. Click on the Pin It button link to see how many times your website’s Pin It button has been seen on your site’s pages, how many times it’s been clicked and most importantly, how many times someone has pinned from your website. You’ll notice that the main categories have some option overlap. For example, all categories allow you to export data so you can use it in your own spreadsheet and create reports as needed. Each of the pins listed within a category is clickable and takes you directly to that pin’s page. Listed pins also show a thumbnail of the specific image users pinned. You can use those popular pins as inspiration for your own images. Another universal feature is the ability to see how people are accessing Pinterest (e.g., via the web or a mobile device) and filter your data based on that information. Find out how your audience accesses Pinterest and optimize your content accordingly. In the top right corner, click Apps to see a menu of different filter options and click the one you want. 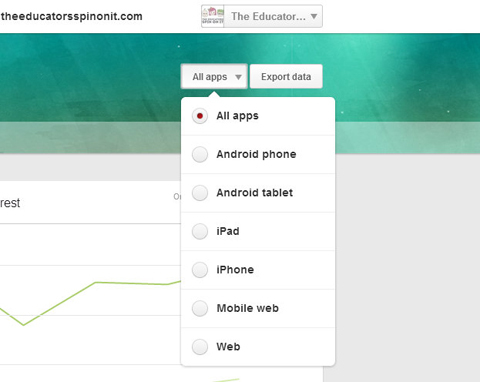 For example, if you only want to see analytics for users who access Pinterest via iPad, choose iPad to filter your data. When you’ve determined how most of your audience accesses Pinterest, turn your attention to your images and optimize them to look great on the apps your audience prefers. Finally, on each page you have a box called Here’s a Tip. These tips are customized based on Pinterest’s evaluation of your stats. Pinterest gives you tips on how to improve your Pinterest stats. I strongly encourage you to take advantage of Pinterest’s free advice so you can make the most of your Pinterest marketing efforts. Sign up for the Pinterest Business Newsletter, Pinterest Business Blog and Success Stories for even more insider tips. Whether you just need a quick high-level overview or want to delve into specific performance factors, you’ll find everything you need in the revamped Pinterest Analytics tool. Take advantage of every feature to discover what’s popular with your audience, how they’re repinning from your boards and what the competition is up to. What do you think? Are you using Pinterest Analytics? Which feature has been most helpful? Please let us know in the comments below. 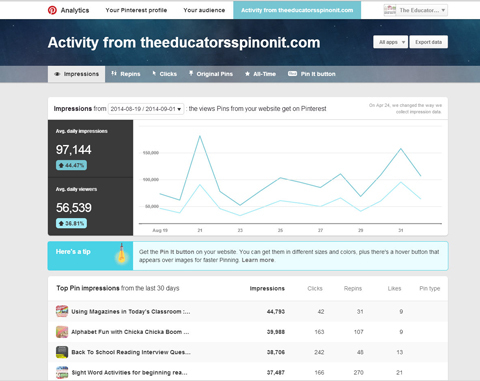 Kim Vij (@EducatorsSpin) is a Pinterest consultant, speaker, freelance writer, educator and blogger at The Educators’ Spin On It pinning for her 1.5 Million Followers on Pinterest.